This collection features Spotlight Solos from five outstanding composers, and includes teaching tips by Victoria McArthur. Features original compositions by eight composers, plus teaching tips by Victoria McArthur. 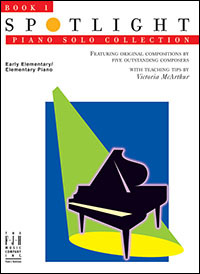 Includes Spotlight Solos from eight outstanding composers, plus teaching tips by Victoria McArthur.